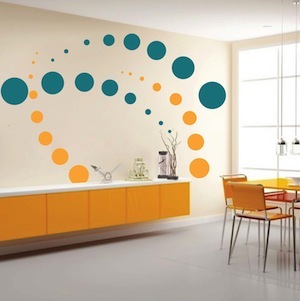 The Contemporary Evolution Dots Wall Decals can turn your plain room into something extraordinary in minutes! Have a blast brightening up your office. Create some memories with your kids while cheering up their room! 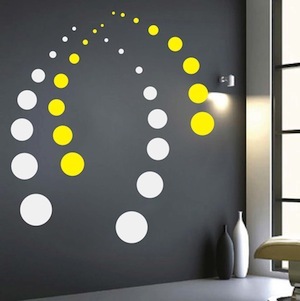 Contemporary Evolution Dots Wall Decals are an easy to install without the hassle of cleaning a brush, roller, or drop cloth when you’re done! Just a touch of fun is all you need to include! Each pack comes with 16 dots. To mix and match, order additional, differently colored packs. I've used wall Decals before, so I knew I loved them, but really am pleased with service & product from this store. The dots look wonderful in my office, were easy to install, and shipped super quick. I'd upload a photo if I could! These are SOOO great!!! I intended them for a guest room but I ordered too large a size so we put them down our hallway wall on one side. We live in a contemporary house and they look so awesome!!! Love them! I added these in blue to an all-white bathroom . . and the change was amazing. I have had compliment after compliment on this room . . I added blue towels and this room is perfect! Came just as advertised. Easy to put on and gives plain white closet doors a pop. I used cranberry and gray for my son's room. Comes off easily too.